Frank Bardacke tells the thrilling, and ultimately tragic story, of one of the most transformative labor movements in American history. Much has been written about the United Farm Workers, but the depth of Bardacke’s investigative reporting, the range of his historical knowledge, and the complexity of his story is unparalleled. 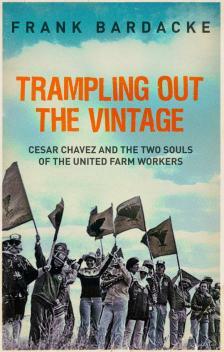 Bardacke grounds his book in the history and tradition of union organizing among Mexican farm workers. He honors farm workers as few writers have done, emphasizing their endurance and skills. In addition to illuminating sketches of UFW activists, organizers and staff, Bardacke presents a detailed and nuanced portrayal of the religious, political and ideological background of Cesar Chavez, the charismatic and brilliant leader of the UFW. All of this is told in the context of the civil rights movement, AFL-CIO machinations, the immigration debate, the liberal left split, the war in Vietnam and California politics. “You can take little sections out of the book and they’re the best thing ever written on the subject,” said Hillman judge Harold Meyerson. While the story of the decline of the UFW is painful, Trampling Out the Vintage still manages to inspire through its compelling telling of how farm workers built one of the iconic social movements of our time. Anyone intent on understanding, or more importantly building a social movement, must read this book. Trampling Out the Vintage is a monumental work of labor and social history.